HTML5 is one of the best adaptive software used in the development world of gaming. Due to its great adaptivity and versatility, it is evolving at a high speed. Its adaptivity and functionality make it one of the preferable game development tool in the world. It is currently the most used software in comparison to other tools currently present in the market. 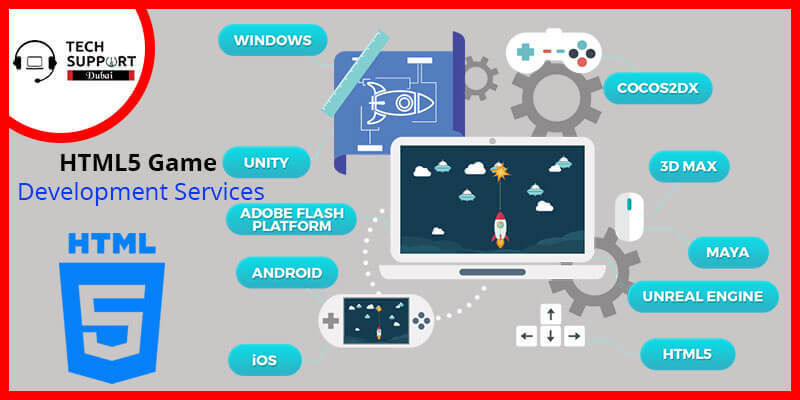 If you want to build a game with HTML5, so that it can run on various platforms, and you are not getting any reliable service within your budget, then you should connect with the experts at Tech Support Dubai. The company hires exceptional team members who are well-trained to provide you with HTML5 game development services to customize your game the way you want. There are many reasons why Developers believe that HTML5 is the best software for Game Development. Among them, some of the primary reasons are mentioned below. Versatility: The process of game development becomes very easy due to great versatility. It is also developed within a short span of time. Adaptivity: It is preferred by many developers for its adaptivity. You don&#39;t need to change much of the code while running the game on different platforms. Graphically Rich: When you develop a game through HTML5, your game becomes much more interactive and graphically rich. It also preferred by clients as there is no restriction for artistic designs. Flexibility: With HTML5, you can add unlimited API to the code, hence saving a great amount of time as well as effort. When it comes to game development, we have well-trained experts at Tech Support Dubai. Our experts are always ready on their toes to help you when it comes to game Development Services using HTML5. We work with full effort round the clock until your project is completed. Our primary target is to make our customer satisfied. We try our best to develop the game in such a way that it stays within your budget. Our service providers ensure that the product is delivered within time. We provide you with the best services when it comes to the game development process. Here is the list of services we provide our customers. Game Design and Art: The game designed by our developers contains world-class graphics along with artistic contents. Audio: The game we build contains excellent audio, which you will enjoy along with the gameplay. Engineering: We develop games, engineered with a perfect code along with ideal physics, art and design. You can directly call on our customer care number: 042053349 for HTML5 game development Dubai. Our experts are available round the clock to assist you with HTML5 Game Development Services. You can also chat with our professionals at Tech Support Dubai via our live chat portal. You can even comment about new ways to develop a game on our portals. Also, you can directly email us at our official email id. Our experts will connect with you and give you the benefits of a perfect game development service using HTML5. We also provide Android game development service in Dubai.